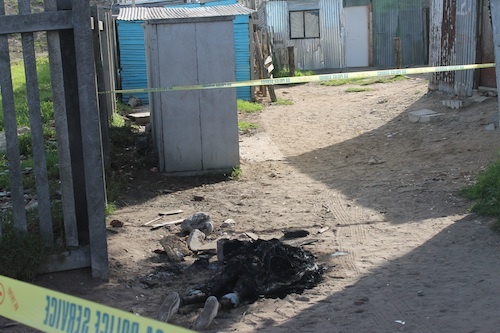 CAPE TOWN – One young man is being stoned or burnt to death every ten days by vigilantes in the Philippi East policing district. Yet while police appeal to communities to report criminals rather than take the law into their own hands, residents say they do not trust the police and vigilante action is the only way to deter criminals in their neighbourhood. In a statement released on 12 September, Philippi East police spokesperson Captain Bheki Xulu, said 14 deaths due to vigilante action had occurred in the precinct since May. The areas included Marikana, Island, Marcus Garvey, Lower Crossroads and Better Life settlements. Xulu said the young men were mostly accused by residents of crimes such as housebreaking, theft and street robbery, and were “boys” in their early 20s. He said the victims’ died “terrible and horrible” deaths and “thorough investigation” was taking place to bring the suspects to book. However, he said members of the community were “not willing to assist police with information”. Samora Machel Community Policing Forum (CPF) chairperson Luvuyo Mamba said they did not support vigilante action and were working with the police to try minimise this behaviour. Mamba said CPF members urging people to report criminal activity and not take the law into their own hands. But a number of women interviewed in Philippi said they had no mercy for criminals in their community. “Iingcibi yamanz ifa ngamanzi (if you are an expert with water, you will die by water), and so the criminals will die because of their crimes,” said one woman. She said those who had the power to exact revenge on criminals must do so because there are many people who have been killed by thieves. She said although she could not bring herself to witness the brutal vigilante killings, if her own son was involved in criminal behaviour she would not protect him from the mob, all she would do is bury him after he’s died. Philippi resident Zibuzele Janda said mob justice was the only way to get rid of criminals in the area because it was the only thing they were scared of. Janda said criminals were not scared of the police because even if they were arrested they would be released soon and would return and continue stealing. She said some of those who had survived vigilante attacks moved to other townships, or even to a different province to start a new life. “I love to watch them suffer like their victims,” said Mzingisi Mboniso, who admitted to taking part in vigilante attacks. Mboniso said people did not trust the police and the community would isolate you if you assisted them. Xulu said of the 14 young victims killed by vigilantes since May, three remained unknown and he asked that people help identify them. He said on 8 May, and unknown “black man” in his early 20s was found stoned to death in Sikhova Street, Lower Crossroads and on 11 August, a “black man”, also in his early 20s was certified dead in New Eisleben Road in Better Life settlement. The man was wearing black takkies, blue jeans and black jacket. The third unidentified victim was burnt to death in Marikana settlement on 11 September after being accused of robbing people. Sanco national spokesperson Jabu Mahlangu was quoted on ENCA news earlier this year stating that “urgent action” was needed to address incidents of mob justice, which “appear to be on the increase”. Mahlangu said vigilantism created a cycle of violence that undermined the rule of law.